The Striiv Touch tracks steps, miles walked, calories burned, active minutes, and sleep duration. The accompanying app is capable of syncing with My Fitness Pal, which is a popular nutrition & calorie-tracking app. This enables you to track not only calories burned but also your caloric intake, which is super useful if you’re watching your weight or nutrition habits. The Touch isn’t the most accurate fitness tracker when it comes to tracking steps, but if you aren’t very concerned with needing 100% accuracy, it certainly gets the job done. The Striiv Touch is a sleek, water-resistant fitness tracker with an informative touch screen that tells you everything you need to know about your current fitness data and goals. We particularly like the device’s form factor — it weighs only 14 grams, and the band is comfortable enough for prolonged usage. The app that comes with the Touch has a neat little game meant to encourage you to get more exercise. If you like playing games on your phone, this could be an effective way to get you up and moving. Even if you aren’t a fan of the game that comes with the app, you can use the app to view your fitness data. The data for the current day can also be viewed from the device itself. The Striiv’s battery life depends on how many notifications you’ve set it up to receive (messages, calls, etc.). Using the Striiv to recieve notifications will also deplete your phone’s battery a bit more quickly — you’ll definitely want to have a phone charger handy when you wear your Touch to work. Depending on these factors, you can expect to get up to five days or so of battery life. The Touch itself charges rather quickly. The Touch has a few pitfalls, but these can easily be overlooked if you keep the product’s price and its best features in mind. The device’s notifications cannot be customized all that much, but there is a touch of customizability, which may be enough for you. • The Striiv Touch’s low cost makes it a great fitness tracker for those new to fitness tracking, or for anyone who doesn’t need a device with a ton of bells and whistles. • Notifications come in handy for those times when you don’t want to check your phone every time it vibrates. With the Touch, you can quickly read your messages and see who’s calling without having to reach for your phone. You’ll finally be able to discreetly read text messages during those pesky meetings. • Connecting your Touch to other apps, like My Fitness Pal, allow you to expand the device’s functionality. • Manually-toggled sleep tracking means the app won’t make mistakes concerning logging your sleep. Whereas some fitness trackers collect extensive amounts of data, the Touch only collects the most essential data — steps taken, calories burned, distance traveled, and minutes of activity, in addition to some sleep data. When it comes to which notifications to receive on the tracker, there aren’t many customization options. The step tracking could be more accurate. Syncing with other apps isn’t always a hassle-free process. The Striiv Touch ships with all the features you’d expect from a fitness tracker. The step counting is accurate enough for casual fitness tracking, and the sleep tracking helps you ensure you’re getting enough sleep each night. The Touch’s battery can last up to five days, and the band itself is light and slim. It only comes in one color — black — and it looks stylish enough to be worn on most occasions. The manufacturer claims the device is water resistant and that it can be worn in the shower, bath, rain, and can survive even the most sweaty of workouts. One of the features unique to the Striiv Touch is the included game. In the game, you accumulate points by taking steps (in real life) and use these points to upgrade your own little fantasy island. While this feature appeals to many, it may not captivate you as much as it does others (like us). In addition to the game, you can also motivate yourself to be more active by adding friends in the app. Once you’ve added your friends, you can see your friends’ and your progress, and challenge each other to see who can take more steps. Your friends will need to have the Striiv app as well, which is the downside to this feature. View any text and notification alerts with the swipe of a finger on the screen. This comes in handy during workouts when your phone isn’t easily accessible. The band can also receive incoming call notifications if you so choose. Sometimes it can be hard to see you have an incoming call, especially if you silence your phone at work. Having an additional avenue of noticing you’re receiving a call can prevent you from having to play any more games of “phone tag” in the future — the next time your phone rings, you’ll be able to see who is calling and answer it. 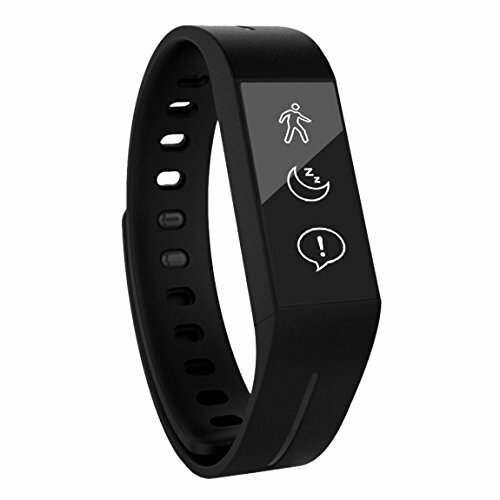 As mentioned above, the Striiv Touch tracks steps taken, calories burned, distance traveled, minutes of activity, and time spent sleeping. The device won’t collect data about individual workouts like some trackers do, but the amount of data it collects should be sufficient for most people. If you’re big into fitness, you may want to look elsewhere, but the Touch can provide most people with enough information to help them improve or maintain their health and fitness. The Touch has a new feature that enables a notification containing the day’s weather each morning. We think this is quite handy and efficient, as it allows us to effortlessly see the forecast without having to check a dedicated weather app. The Striiv Touch is not the most accurate step tracker, but it does the job well enough for the average person. The device can sometimes track various arm movements as steps, such driving or typing on a keyboard. If you keep in mind that the number of steps reported is an estimate, you should have no trouble determining if you were active enough on any given day. Inexpensive – The Striiv Touch is one of the less expensive fitness trackers on the market but is still fully functional. Tracks essential statistics – The Touch gathers the most important statistics about your daily activity and sleep, and display all this data in the accompanying app. A handy notification display – The device’s ability to display incoming calls and messages is one of the features we like most about it. Sleep tracking – Make sure you’re getting enough sleep by using the device to track your nightly sleep. The Striiv Touch reviews on Amazon have a few things to say about this particular fitness tracker. The device is easy to set up and connect to My Fitness Pal, and it is available at an even lower price than before. The notifications are useful for situations where you don’t, or can’t check your phone. If you also find yourself working, with your phone plugged in and charging out of reach, being able to see incoming messages and calls can be an invaluable feature to have. Some customers have lamented the battery’s shorter-than-advertised life. Even with notifications turned on, your Touch should still last you a few days. It may not last the full five days, as advertised, but it will last at least 2 or 3 days with moderate to heavy usage. This should give you enough leeway to be able to charge it at a time that is convenient for you. The band also seems to be the source of headaches for a few customers. If you happen to hit your wrist on something, the band has the potential to unfasten from your wrist. This can also happen from time to time when you reach into your pocket. One customer reports finding success using a rubber band to keep the Striiv on their wrist, but your mileage may vary. “steps taken” data to be inaccurate in their Striiv Touch reviews. We’re assuming the difference in accuracy is due to an update to the tracker and its app, as the more recent reviews support our view that the data collected is amply accurate. If you cut the Striiv Touch some slack, it can be the perfect fitness tracker for you. It won’t single-handedly improve your health and fitness, but it could be helpful in motivating you to be more active. If you’ve never used a fitness tracker, the allure of accumulating steps can be sufficient to have you opting to walk a longer route than usual from point A to point B. The game is also a nice touch when it comes to motivating owners of the device. If accuracy and amount of data collected are what you’re after, there are better, but more expensive fitness trackers on the market. If all you truly need is a slight increase in motivation and enough data to verify that you’re making progress, the Striiv Touch has you covered.